The term “third place” was coined by Ray Oldenburg, an American urban sociologist. The “third place,” according to Oldenburg, “denotes territory that is inexpensive, easy to get to, welcoming, offers food and drink and people to chance to meet new people and feel companionship." Quite a transformation indeed: A derelict idustrial site that has successfully transitioned into a multi-venue arts centre and forum for a myriad of art related activities, still radiating the charme of the original railway workshops it once inhabited..
Social and cultural diversity ranks high on Carriageworks’ agenda with a focus on artists themselves being at the helm of the operation and artist-led in nature, the organisations in residence produce diverse multidisciplinary programs and collaborations in its cavernous halls, corridors and spaces in tandem with local and international artists. A location that could not be more ideal for Sydney Contemporary’s Opening Night which opened the floodgates for Australasia’s premier international art fair with the country’s largest and most diverse gathering of local and international galleries. Dedicated to injecting new blood and vitalizing Sydney’s art scene, the third edition presents over ninety galleries from across the Southern hemisphere alongside an ambitious five-day program that includes curated projects, installations and panel discussions with the artworks running the gamut of mediums and sizes. First and foremost, it is an accessible and not at all the artsy fartsy elitist affair other art events limit themselves to but an inclusive, immersive and expansive experience. The Fair is also home to pop-up restaurants by Sydney’s much-loved dining institutions making it an all-encompassing art and dine experience, e.g. Billie Kwong and Kitchen by Mike as well as a Glenfiddich whisky bar and a Petaluma wine bar. The official opening night party offered ample opportunity to peruse the offerings of the galleries whose presentations have grown commensurate with the size of the now yearly event. The focus of the exhibits were on new oeuvres, making the affair live up to its name: A truly contemporary display of the status quo which over the five days will expand outside the confines of Carriageworks to culminate in afulminant celebration of all things art, includingdance and choreographic performances and an array of free late-night parties. 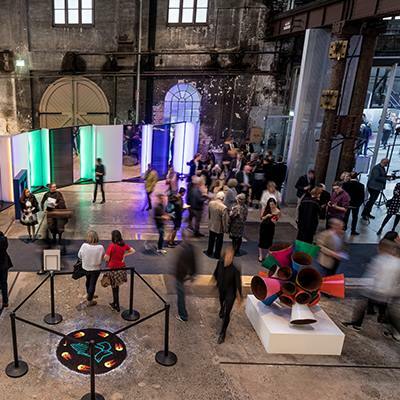 Sydney Contemporary takes place from September 7-10 at Carriageworks and participating venues around the city. Photos from Sydney Contemporary website.